The MXR® Custom Shop is all about sonic discovery. In their effort to explore the furthest reaches of tone, the Custom Shop team invites accomplished independent pedal designers from around the world to contribute their unique perspectives and design styles to the cause. The first such collaboration is the Il Torino Overdrive, a highly tweakable overdrive pedal designed with Carlo Sorasio, Italy’s top tone maestro. He works with Italy’s top musical acts, designing amps and pedals to suit their needs on the road and in the studio. He sat down to talk with us about his entry into the world of pedal designing and the creation of the Il Torino Overdrive, a highly tweakable OD that’s perfect for guitar players who like to fine-tune each part of their signal chain. When did you first start designing pedals? Carlo Sorasio: While attending Polytechnic University of Turin, I studied electronics on my own, particularly analog electronics, using old books I found in the school library. I started out just building pedals for myself as a guitar player. The first was a Dallas Rangemaster clone in 2004, and I modded many other pedals, including ones from MXR and Dunlop. I started my business in 2007 after completing my mechanical engineering degree. In 2008, I released my first amp commercially and continued to perfect the design until 2010 when I deepened my understanding of PCB and transformer design. Carlo: I have worked with some of the finest Italian guitar players. Some of the most important are Mario Schilirò (guitars for Zucchero Fornaciari), Giacomo Castellano (Thomas Lang, Nannini, Elisa, solo), Massimo Varini (Boccelli, Pausini, Ramazzotti), and Water Donatiello (Gerry Mulligan, Stevie Lacy, Bruno Chevillon). Internationally, I have had the pleasure of working with Stef Burns and Stevie Salas. Stevie and Stef, when and how did you meet Carlo? Stevie Salas: I met Carlo when I was playing a concert a few years back in Turin. When I arrived for sound check, he was there working with the opening act. He showed me some pedals as well as some custom amplifiers. I get approached a lot by gear designers, and usually they don’t impress me, so I wasn’t that excited. But he was a nice guy, so I decided to plug into the amp he had onstage. As soon as I plugged into it, I knew right away that this was something VERY special. After that, he showed me some of his custom pedals, and needless to say, his overdrive blew my mind. I ended up both the amp and the overdrive for my concert that night and for the rest of the tour! In fact, I have used them on every European tour since. Stef Burns: I also met Carlo at a Turin gig. He had an amp that he built for me to try, and it rocked! Carlo, what would you say is your specialty as a pedal designer? Carlo: So far, overdrive and boost pedals. But I am expanding my range of expertise and am currently working on phaser, flanger and delay effects. I think that, especially for a self-taught guy like me, it’s normal to start with the overdrive and boost. Simple projects that help to learn the basics. Modulation and delay, however, are more complex, and it takes more skill to avoid simply copying other designs. And these skills can only be obtained through experience and mistakes—lots of mistakes! Stef: He obviously has knowledge and a talent for building amps and pedals but he also has an ear for tone so he can do it right. Stevie: I meet many guys around the world who do what he does and the difference between good and great can be measured by a micrometer. Carlo has a way of making amps and effects that sound vintage/modern capturing the best of the old with a little something new in there. He has also found a way to use modern techniques to achieve this making the pedals and amps affordable without losing quality. Which of his products do you own? Stef: I have the Blues Devil and it works great for adding a singing tone to clean and extra gain to lead. Stevie: I have his Il Torino Overdrive in a prototype form and some of his prototype amp heads. Over the years, I have had him do some mods to the pedal. 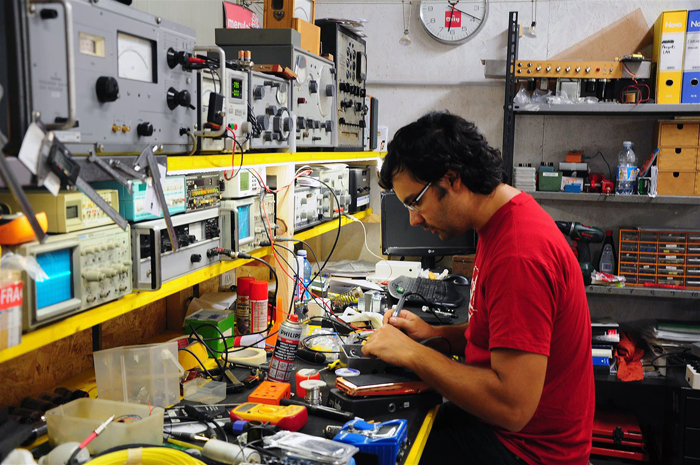 Have you worked with Carlo to develop any custom gear? Stevie: We have worked closely on his overdrive, and we are messing with old Jet Phase type effects. Carlo, which circuit designs have inspired you the most? Carlo: Well, as I said the Dallas Rangemaster Treble Booster was the first pedal I ever made. It’s a very simple circuit—just 7 components and one transistor—but it’s a pain to make t play well. When you get it, though, it’s amazing. That circuit taught me the importance of each component and how it contributes to the final result. 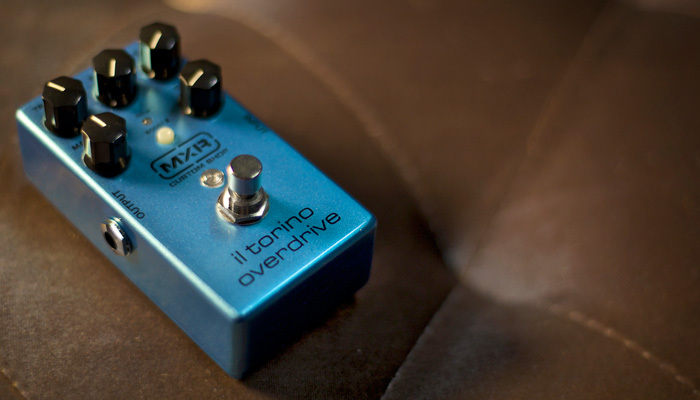 Tell us about the MXR Il Torino Overdrive. What sound and functionality were you shooting for? Carlo: The Il Torino Overdrive is an overdrive pedal for fine-tuners. It’s very versatile and very organic sounding at any of its settings. At first, I was searching for a Zeppelin sounding overdrive with a great touch response and a rough tone. These characteristics are still present in the final product, but we ended up with a broader, more versatile spectrum of overdrive with very nice, natural compression. Carlo: I used MOSFET circuitry to recreate the structure of classic tube preamps and LED diodes for their warm, open sound, and I used both local and global feedback to enhance touch response and introduce a bit of asymmetrical saturation. Rolling back the volume on your guitar will clean up the sound without reducing the overall output too much. You can I was very careful to choose the right components for this pedal, particularly the LED diodes, which are very critical to the tone of the Il Torino. I made the pedal much more versatile by adding a simple but powerful three-band EQ section. Each of the knobs is highly responsive across their range, so players will be able to fine-tune their overdrive sound to their liking. The last feature I added was the dual mode OD/BOOST switch, which allows players to toggle between the more aggressive overdrive sound and a cleaner sound that has just the right amount of compression and a lot of sustain. One of this pedal’s main features is that it has a special type of buffered bypass switching rather than true bypass. The type of buffered bypass in the Il Torino uses a Class A Low Impedance Output Driver to maintain natural tonal warmth when using long signal chains. You can’t prevent that kind of signal loss with true bypass. What type of player will be most interested in this pedal? Carlo: Players of any style, from blues to hard rock and even fusion, will find this pedal very useful for both their overdrive and boost needs. Especially those who like the sound of handmade boutique amps and like to customize their tone. What’s the best way to use this pedal? Any particular guitar (humbucker vs. single-coil) and amp combination? Carlo: The Il Torino is best used with an amp that is just breaking up. It is a subtle overdrive that doesn’t distort basic sound of your guitar, so you’ll still be able to recognize your own tone. As far as specific amps, the Plexy, JCM800, and Blackface-based circuits are the best for this pedal rather than hi-gain amps. I prefer humbucker pickups for the OD mode. It sounds great with single coils, too, but players may want to roll off the treble to balance out the tone.